The Devonport and District Tramways Company Ltd, part of the British Electric Traction Company Ltd group, was authorised to construct lines from a terminus in Morice Square to Camel's Head and from a terminus in Fore Street (completely separate from that of the Plymouth, Stonehouse and Devonport Tramways Company) to Milehouse and Pennycomequick. They also could construct lines to link Pennycomequick with Albert Road, and Milehouse with Albert Road, to enable services to carry workmen for the Gun Wharf and Keyham Steam Yard. 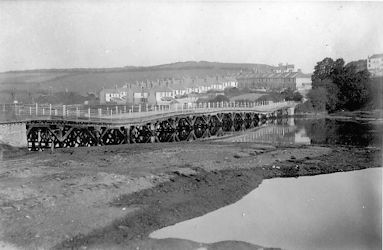 In addition, Devonport Corporation obtained an Act of Parliament to construct extensions from Weston Mill (the far side of a wooden bridge from Camel's Head, to Saint Budeaux Square and Saltash Passage and also from North Keyham Gate along Saint Levan Road, and through Milehouse to the Borough boundary at Tor Lane. It was all built to the 3 feet 6 inch gauge and electric from the outset. A route network of five services was devised stretching to the Borough boundaries at Pennycomequick, Tor Lane and Saltash Passage. The Board of Trade inspection took place on Tuesday June 11th 1901 and the official opening on Wednesday June 26th 1901.
rather "shakey" bridge across Weston Mill Creek. The Company's tramcar fleet of 33 electric double-deck tramcars was kept and maintained at two depots, the principal one being at Milehouse, off Tavistock Road, and a smaller one at Camel's Head held two tramcars, numbers 22 and 24, to operate the isolated stretch between there and Saltash Passage. The Company livery was chocolate brown and cream. In 1903 the Corporation completed an embankment to replace the wooden bridge and the Saint Budeaux part was joined up to the main network. Two accidents took place on the steepest part of the network in Tamar Terrace, and another at the bottom of Albert Road. A set of Speeds and Stops Regulations were introduced in 1914. Following the amalgamation of Devonport and Plymouth in 1914, Plymouth Corporation Tramways Department took over the Devonport and District Tramways Company network on Saturday October 2nd 1915.